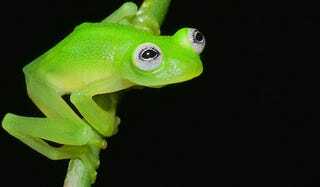 We’ve found Kermit the Frog in real life and it’s a species of glassfrog just recently discovered called Hyalinobatrachium dianae in Costa Rica. It’s bright green just like Kermit, has big white adorable eyeballs just like Kermit and the males have a very unique mating call... just like Kermit, I guess? Anyway, the resemblance is uncanny. Recently discovered by Brian Kubicki of Costa Rican Amphibian Research Center, he writes what makes this real life Kermit the Frog, H. dianae, so unique in his abstract, which you can find here in a PDF.